The daughter of garden writer Anne Scott-James, Clare Hastings was a latecomer to gardening, daunted as a child by the Latin names, and with the belief that pruning was "something best left to grown-ups." She has since discovered the joy of gardening. Clare acknowledges that gardening is in her DNA and what she has learned came from her mother. Gardening Letters to my Daughter by Anne Scott-James and Clare Hastings was published in 1990. By means of light-hearted letters, Anne imparted gardening knowledge to Clare, who occasionally responds. Now, after many years' experience of her own inherited cottage garden, Clare shares her gardening life notes with Calypso, her daughter, and a reluctant gardener who one day will inherit Clare's beloved cottage garden. It is divided into chapters, each on a specific topic, some inspirational and others more practical (plus the occasional recipe). 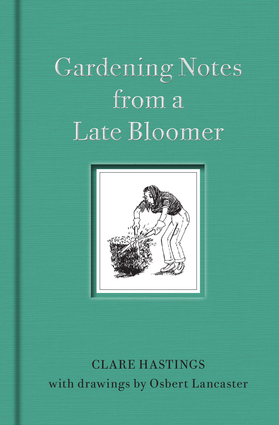 Clare gently and humorously imparts advice and guidance which will be useful for anyone coming to gardening for the first time—late bloomer or not. The book is illustrated with drawings by Osbert Lancaster, who was Clare's stepfather. Clare Hastings is a former stylist and later costume designer. Osbert Lancaster (1908–1986) was a painter, a writer, a cartoonist, a theatre designer, an authority on architecture and design, and above all a great British humorist.